The "specialty bagels" are the ones with melted cheese or cheese and tomato sauce all over the top. 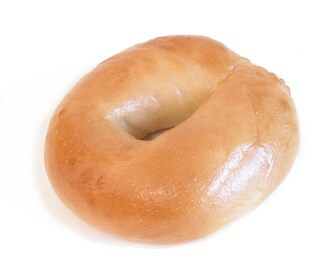 The regular bagels are plain, seeded, onion, etc. Thus the plain and seeded bagels from bins labeled Specialty Bakeries are not priced as Specialty bagels; they're priced as regular bagels. Got that? And...you've probably guessed it...cheese-covered bagels from the bins labeled Seattle Bagel Bakery are priced as Specialty bagels. Yes, I went and talked with a store employee (not the bakery manager) who agreed this might be a tad confusing. We agreed the pricing sign should refer to regular bagels and deluxe bagels (or perhaps cheese-topped bagels). Or perhaps there should be prices on the individual bins. What puzzles me most is that the folks at Specialty Bakeries haven't been up in arms about this signage, which appears to render their (IMHO superior) bagels twice as expensive as the rival brand.